Published on August 31, 2018 August 31, 2018 by Rachelle J. This check-in is for August 24th – 30th. I’ve temporarily changed my workouts from the strength and circuit training I had been doing to walking “workouts” in which my FitBit registers at least 20 consecutive Active Minutes. My back has continued to bother me, so I’ve been giving it a break as much as I can. Published on August 28, 2018 by Rachelle J. Total books for the year: 64 of 90. Sunday was the end of another #BoutofBooks! I didn’t meet any of my goals, and I barely had any time to squeeze in some reading during the entire week. Yesterday, not only did I not have time to post anything before I left for work in the morning, but I went with the Boyfriend to a Smashing Pumpkins concert (which was awesome!!!) and was too exhausted when I finally got home to do anything but fall into bed. Don’t even get me started on this morning! 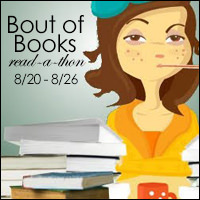 COYER ends this week, but RIP 13 begins, and there’s also a Something Wicked This Fall Comes kick-off readathon over at Seasons of Reading over the weekend! To top it all off, the Boyfriend and I are celebrating our 5th anniversary by going to the Scottish Highland Gathering. I will be using Labor Day to look over my work and personal calenders to come up with a plan to avoid things like posting “Monday Minutes” on a Tuesday. I was supposed to post this yesterday, but my life has been a bit crazy and extra busy and I’m just now getting a chance to catch up on some things. I didn’t meet any of my goals for this Bout of Books. With as busy as I am at my new job and adjusting to working full-time, I’m just glad I was able to read a few pages on most days. The next Bout of Books is in January, so I’m sure I’ll do much better then. Published on August 26, 2018 by Rachelle J.
I went to a coffee shop yesterday and read a couple of chapters of Wanderlust by Rebecca Solnit. Afterwards I went to a bookstore. I found a magazine, “Real Simple,” and decided to read most of it when I got home, so while I’m not counting that toward my total pages, I am going to count it for time. I took the time this morning to go to a coffee shop near work and sit down to read a few pages of Seraphina by Rachel Hartman before my day got crazy. It went a long way towards keeping me relaxed throughout the day. I didn’t feel nearly as overwhelmed as I had been feeling when I didn’t have time to let anything I’ve learned sink in at my new job let alone the time to read something not related to work. Apparently I was wrong about Wednesday being the worst reading day this week. I was too busy to read anything yesterday. I love my job, but I’m really glad today is Friday! I’m fairly certain that yesterday will go down as the worst reading day of the whole week. I only ended up reading a few pages of Seraphina by Racel Hartman. I was far too busy for anything else during the day and too tired by the time I got home. Hopefully, today will be a much better reading day. Published on August 22, 2018 by Rachelle J. Yesterday was even more busy for me than Monday. I got a little bit of reading in, mostly during my commute, but not much.